Yoga, surfing and spectacular beaches. Sound like Bali? Think again. Life is simple on the south-western tip of Europe. 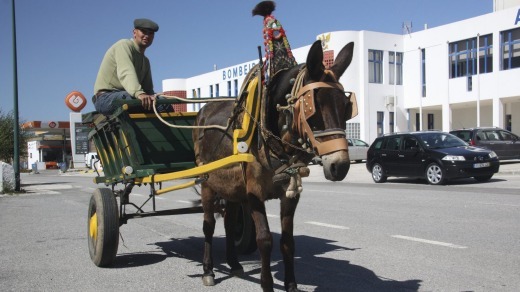 On Portugal's western Algarve, people live from fishing boat to table, men in woollen caps stand in the sun outside family-owned cafes lingering over espressos and cigarettes, and it's not unusual to see a horse-drawn cart amble by or a shepherd with a crook ushering his flock over a dusty hill. It's a world away from the "other" Algarve, with its wall-to-wall condos clambering for uninterrupted views of the Med. Here, land meets sea at windswept Atlantic beaches. Wildflowers carpet undeveloped headlands. 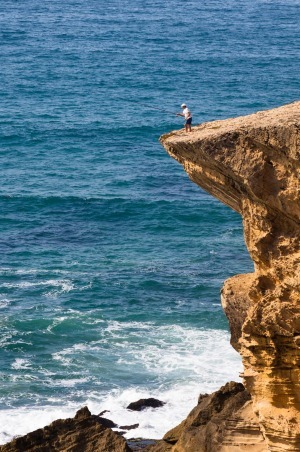 When a new clifftop walking trail opened in 2012 (see below), The Guardian called this "the wildest, most unspoilt coastline in southern Europe". 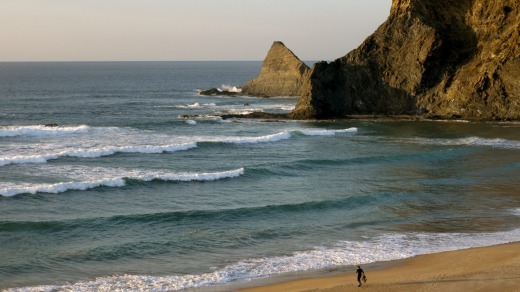 All of which makes it the perfect location for a yoga and surfing retreat with a difference. Just outside the cobbled, white-washed town of Aljezur, with its 10th-century castle, Tipi Valley is the accidental dream of 46-year-old Australian surfer Laurie Quirk. Originally from the Gold Coast, Quirk has nomadic living and noble causes in his blood. His mother was from Finland, his father a journalist in the Whitlam government until, in the early 1970s, they sold the family home, bought a yacht and took Quirk, then aged five, and his two brothers on a round-the-world sailing adventure. He's been on the move ever since. Eight years on, the camp remains faithful to its minimalist, low-impact roots. 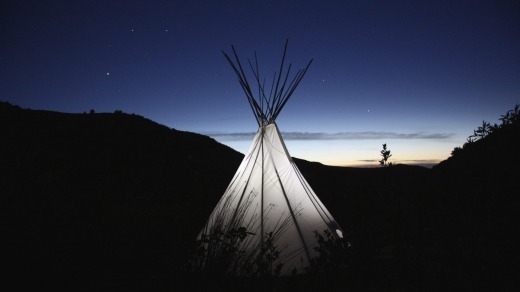 Quirk's original tipi, which sleeps five, is the focal point. I first met him in Japan 20 years ago when we were both living and working there. Since then Quirk has made himself at home all over the US, and in Europe and Africa. In 2005, the siren call of perfect, uncrowded waves lured him to southern Portugal. He bought six hectares of land on the western Algarve, put an American Indian tipi on it (because of its simplicity and small footprint) and spent the next two years living there, surfing, doing yoga and growing his own organic food. One night, he was sitting by the campfire with a few mates when one of them said, "You know, a lot of people would pay good money to live like this for a week." 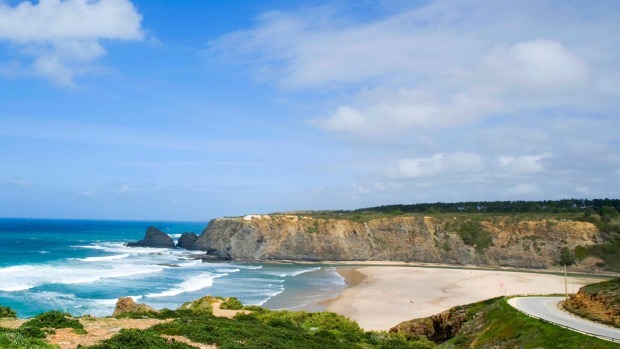 Portugal's first yoga and surfing retreat was born. But it was always about more than yoga and surfing for Quirk. "In the early days of building the camp [in 2007], we were all living as a little community of like-minded people with common values and ideals and a shared passion," he says, "and I noticed that we were content and very happy and grounded. Yoga and surfing were part of it, but it was also about living in nature and keeping things simple. Living this way, even for a few days, was a sort of holistic therapy that really worked." Eight years on, the camp remains faithful to its minimalist, low-impact roots. Quirk's original tipi, which sleeps five, is the focal point (he now lives in a solar-panelled, mud-brick house he built a few years ago) and other tents and smaller tipis, which can accommodate up to 12 guests at a time, inhabit their own secluded spaces. It's off the grid: there's no mains electricity or town water, no mobile reception or Wi-Fi. There's solar power; cool, clear drinking water from an on-site well; organic fruit trees and an organic veggie garden; bottled gas for cooking – and no generator, making the camp blessedly quiet at night, but for the rumble of the surf. Surfing at Odeceixe beach in the Algarve, Portugal. It's also open only half the year, from May to October. People would come at other times, Quirk says, particularly to escape the northern European winter, but in keeping with Tipi Valley's low-impact ethos, he and his staff close the camp and remove the tents and tipis at the end of each summer to let the land "rest" between seasons. The camp is intentionally rustic, but far from rough. There are comfortable beds in the tents/tipis, with duvets, pillows and mosquito nets. Posies of wildflowers in glass jars on the bedside tables. Locally sourced bamboo-walled bathrooms with solar hot showers open to the sky and the stars. The Moroccan Lounge communal tent has couches, books and a hamper full of blankets for cool nights. There are just five other guests the week I'm there: all women, from New York, the Netherlands and the UK. All have at least some yoga experience; I'm the only one who has surfed. Not that it matters. Tipi Valley welcomes everyone: men, women, children, experienced yogis/surfers and newbies alike. On our first morning, Cecilia, the camp's Brazilian manager wanders from tent to tent at the civilised hour of 8am, gently tapping a singing bowl to rouse us for pre-yoga tea and fruit. We emerge from our tents and make our way to the outdoor yoga space, a hessian-covered padded floor shaded by native cork trees (yoga mats are provided too) with views down the valley. There we meet our softly spoken Italian-Korean yoga teacher, also called Cecilia, who leads us in saluting the sun as it peeps over the surrounding hills to brighten the day. If there's a more peaceful, natural way to greet the day, I haven't found it. The days tumble into an easy, and full, routine. 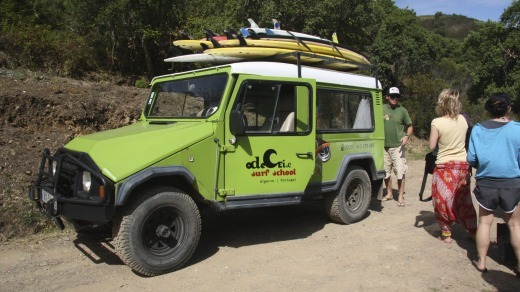 After an outdoor breakfast of muesli, fruit and freshly brewed coffee, our "surf mobile" arrives – Odeceixe Surf School's lime-green, ex-army jeep – and we pile in the back for a short, scenic drive to one of three local beaches: Odeceixe​, Monte Clerigo​ or Amoreira​. Along the way David, our driver and owner of the surf school, plays tour guide, showing us something new on each trip to and from the beach: an ancient windmill with vanes made of canvas sails; fishermen perched on cliffs 30 metres above the crashing sea; divers gathering goose barnacles, a local delicacy, from rocky outcrops offshore. At the beach, we wriggle into 4mm wetsuits (even in mid-summer the Atlantic is a chilly 14 degrees) and carry our surfboards to the water's edge. While the others have a two-hour lesson with Rogerio, Odeceixe's dashing head instructor, I go surfing, sometimes persuading Quirk to take the morning off to join me. 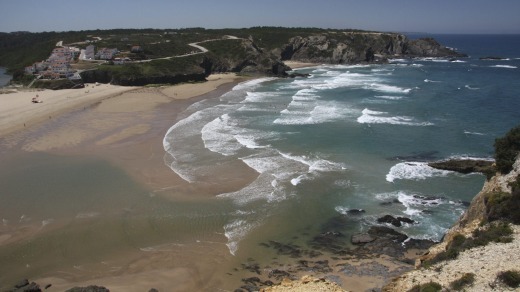 Afternoons are free: a picnic lunch, some towel-time, a few icy dips in the sea, maybe a post-surf pastel de nata or two (Portuguese custard tarts) or mini bottles of Sagres, the local beer, named after the chalky point that juts towards Morocco 50 kilometres south of here. As yoga retreats go, Tipi Valley has a pleasantly relaxed attitude to sugar, caffeine, even alcohol. One night, after our evening yoga session – being a surfer herself, Cecilia knows just the right asanas to gently stretch and soothe surf-sore muscles – Quirk puts on a "real Portuguese-Australian barbie" with locally caught bream, salmon, prawns and squid, organic sweet potatoes and zucchini from the garden, and local vinho branco, Portuguese white wine. The days are so long, there's time for after-dinner walks along the valley. Sometimes we lie back in the deck chairs outside the big tipi, cradling hot cups of chamomile tea and watching the first stars appear. It's a rare night that we're not all ready for bed by 9.30pm. Our last day starts with yoga on Monte Clerigo beach, followed by a picnic breakfast before we all paddle out for our last surf together. The waves are the best we've had all week, and in between rides we sit on our surfboards in deep water looking back at the cluster of pastel-coloured houses overlooking the beach, the sea cliffs extending north and south into a haze of salt spray. Back on the beach, a few of us hike up onto the headland at the southern end of Monte Clerigo to look down at glittering rock pools and the turquoise sea. Who knew the Atlantic could look like this? Tipi Valley is a special place, where disconnecting from the man-made world, spending a week playing in the sea with new friends, and living simply and close to nature seems to rewire your sense of time, and space. I can't remember the last time I felt so "at home" on my travels. It's just as Tasmanian photographer Peter Dombrovskis once put it: "When you go out there [into natural, wild places], you don't get away from it all, you get back to it all. You come home to what's important. You come home to yourself." The writer was a guest of Tipi Valley and Etihad Airways.